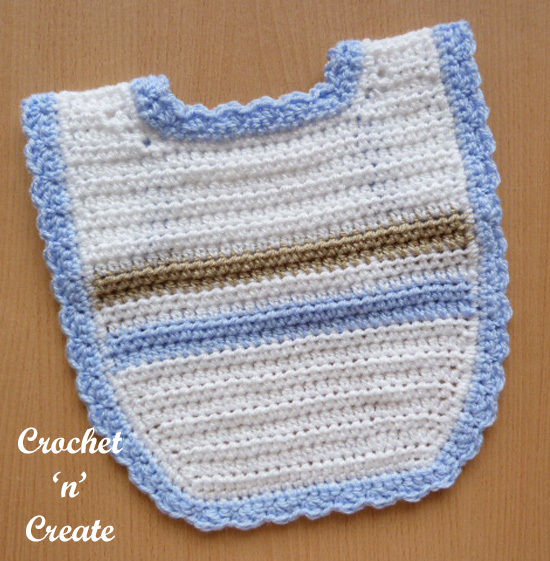 A crochet baby bib makes a great gift for new arrival and is ideal baby showers for work colleagues, friends or family, cute to look at and quick to make. See my Baby Socks and Baby Mittens patterns. yo, pull up loop from each of next 2hdc, yo and draw through all loops. 3rd row – ch1, 1hdc in base of ch1, 1hdc in each hdc to end. Turn. 4th to 9th rows – Rpt last 2 rows until you have 31hdc in all. Fasten off. Turn. 10th and 11th Row – Join in color 2, rpt 3rd Row. Fasten off. 12th and 13th Row – Join in color 1, rpt 3rd Row. Fasten off. 14th and 15th Row – Join in color 3, rpt 3rd Row. Fasten off. 16th to 22nd Rows – Join in color 1, rpt 3rd Row. Turn. Work should measure approx 6.5 Inches from beginning. Row 3 – ch1, 1hdc in base of ch1, 1hdc in each hdc to last 3hdc, dec 1hdc over next 2hdc, 1hdc in last hdc. Turn. (5hdc). Row 16 – ch1, 1hdc in base of ch1, dec 1hdc over next 2hdc. Fasten off. Second Side – With RS of work facing, skip next 15hdc, using color 1, yo pull up a loop from next 2hdc, yo, pull through all loops, 1hdc in each hdc to end. Turn. (7hdc). Row Sixteen – ch1, 1hdc in base of ch1, dec 1hdc over next 2hdc. Fasten off. Edging – With RS facing and 4.50mm hook join color 1 with a sl st to top left corner of neck edge, ch1, 1sc in base of ch1, work one row of sc evenly all around outer edge of bib to end, sl st to first sc on beginning of row. Fasten off. Next Row – ch1, (1sc, 2dc) in base of ch1, * skip 2dc, (1sc, 2dc) in next sc, * rpt from * to * around all sides to last 2dc and sc, skip 2dc, 1sc in last sc, sl st to first sc. Fasten off. Finishing – Weave in and trim off any loose ends of yarn, attach button to correspond with button hole. 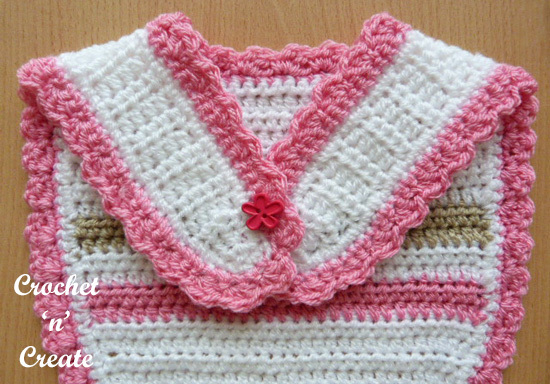 Hope you enjoy it this free crochet pattern for baby bib, don’t forget to pin! The written instructions and pictures for this baby bib pattern are copyrighted to crochet ‘n’ create © 2017. 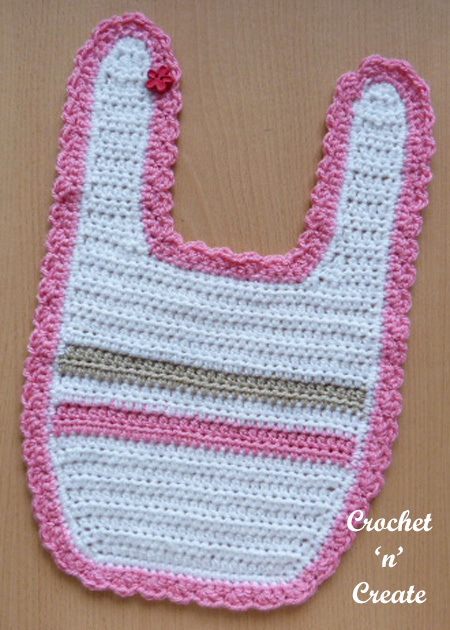 You are welcome to sell the finished products made from the free crochet baby bib pattern, I just ask that you use your own pictures and put a link back to crochet ‘n’ create. This entry was posted in Baby crochet pattern, crochet baby bibs and tagged baby crochet, baby crochet patterns, crochet, crochet baby bib on 31st October 2017 by crochetncreate.